BT Group (BT), the largest provider of broadband and mobile services in Britain, sports a 6% dividend yield. Given the generally stable nature of many telecom stocks, BT may appear to be an attractive holding for a retirement portfolio. However, with the company's turnaround efforts struggling, a new CEO taking the helm, and a need to increase investments in its network, is BT's dividend safe? 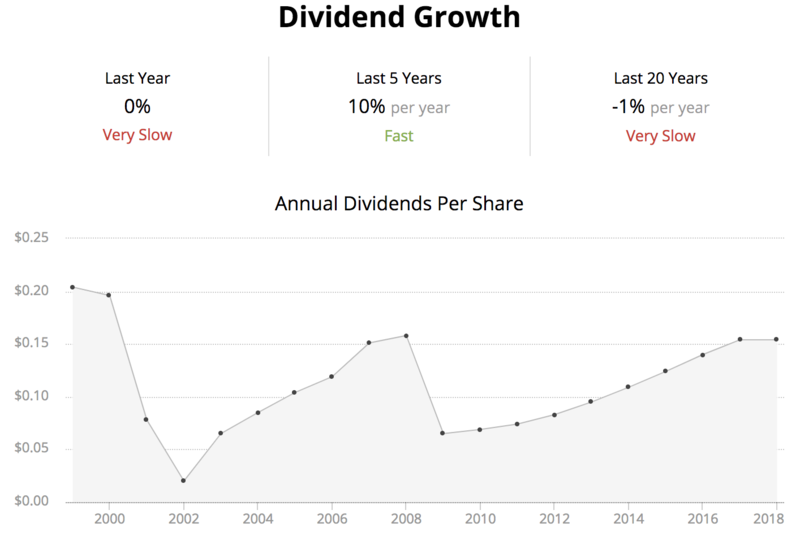 Let's take a closer look at the firm's unusually high dividend yield. BT's sprawling business covers a number of important markets, including mobile phone services, broadband internet, voice, IT services, and fiber broadband. Despite the company's impressive scale, BT's stock price hit a six-year low in 2018. As Reuters summarized, BT faces a number of challenges including "intense competition, an underperforming IT services unit, a huge pension deficit and criticism of its broadband plans." BT's reputation also took a hit in 2017 when an accounting scandal surfaced, ultimately resulting in a £530m write-down. But the biggest issue is BT's ongoing struggle to achieve profitable growth. As you can see below, the telecom's revenue steadily eroded over the past decade. The jump in fiscal 2017 was driven by its £12.5 billion acquisition of EE, the U.K.'s largest mobile operator. However, organic revenue and EBITDA continued declining at a low single-digit clip. Simply put, management acknowledged the need for BT to cut costs and increase its investments, especially in fiber-to-the-premises and mobile infrastructure, if the business is to return to profitable growth. As the company shows below, regulatory price decreases and cost inflation are expected to remain significant headwinds at least over the short term, leaving BT with few levers to pull besides taking out costs. After the company missed its fiscal 2018 revenue goal and guided for flat profits for the next several years, BT's board decided to move on to a new CEO to continue leading the firm's turnaround. In June 2018 BT announced that Philip Jansen would take over as CEO starting on February 1, 2019. Mr. Jansen previously served as CEO of Worldpay, a global payment processing firm. As BBC News noted, Mr. Jansen steps into a number of challenges. Not only has BT lost the confidence of most shareholders and faced criticism for underinvesting in its network, but Mr. Jansen must deal with "intense competition from rivals, an underperforming IT services unit, a huge pension deficit and criticism of its broadband roll-out plans." Given BT's disappointing performance, new leadership at the top, and need for increased investment to turn around its business, let's review its dividend safety. Can BT continue paying its current dividend? From a purely financial perspective, yes, BT's dividend is covered by the company's free cash flow, and the firm's balance sheet is reasonably supportive of a safe dividend. More specifically, with one quarter left to go, management anticipates BT will generate £2.3 billion to £2.5 billion of free cash flow this fiscal year. BT's dividend consumes approximately £1.5 billion per year, resulting in a seemingly reasonable free cash flow payout ratio between 60% and 65%. From a leverage perspective, BT's balance sheet holds £11.1 billion of net debt, and the company also has a pension deficit of £5 billion. Based on management's EBITDA guidance for fiscal 2019, BT's net debt / EBITDA (leverage) ratio, including unfunded pension debt, is approximately 2.2. That's reasonably healthy and helps explain BT's investment grade credit rating of BBB from Standard & Poor's. So why have we had BT's dividend flagged as "Unsafe" with a Dividend Safety Score of 40 for more than a year? "In a competitive market we will need to be absolutely focused on our customers’ needs and pursue the right technology investments to help grow the business." Prior to joining BT, Mr. Jansen was named the CEO of Worldpay in 2013 and, as seen below, about doubled the company's sales until his departure in 2018. Worldpay did not pay a dividend, and Mr. Jansen led an overhaul of the company's technology infrastructure while investing significantly to enhance Worldpay's capabilities, according to Compelo. Simply put, Mr. Jansen's most recent experience and comments suggest he may try to execute a similar strategy at BT, stepping up investments to improve the company's long-term prospects. Unfortunately, BT is only retaining about £1 billion of free cash flow per year after paying dividends. With profits stagnating and the company needing to continue managing its balance sheet while spending money on restructuring, there's not much wiggle room to step up investments into critical areas like fiber. “From this £1bn, BT has to support the pension deficit, buy spectrum, buy back employee share options to prevent dilution, and fund restructuring. If new CEO Philip Jansen wants to increase investment to drive a return to growth, this would shrink the £1bn of headroom for such costs, putting the dividend under pressure." Berenberg thinks management will keep their promise to maintain BT's next two final payouts. However, the firm ultimately believes BT's dividend will face a 30% cut for fiscal 2021 onwards to provide more capital for fiber network investment costs, according to the Financial Times. BT is no stranger to dividend cuts, having axed its payout twice since 2000. While a third cut would be painful for income investors, it may be the best move to improve BT's long-term outlook for profitable growth. An imminent dividend cut seems unlikely, but the new CEO's background and unspecified capital allocation plans make BT's longer-term dividend safety profile rather murky. The company's various business units continue facing intense competitive and regulatory pressures as well, increasing the need for BT to act with greater urgency. 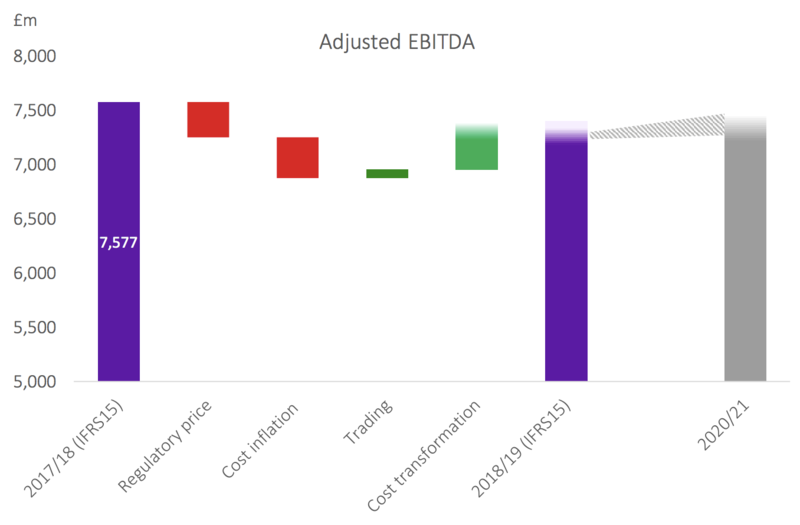 BT's organic revenue is down 1% through the first nine months of fiscal 2019, and adjusted EBTIDA is flat thanks only to cost cutting and moderate profit growth in its Consumer segment. Consumer: "While our mobile market share is broadly flat, trends in the high-end smartphone market continue to be challenging. We are seeing aggressive broadband price competition. In addition, we will be impacted through the next year by a number of headwinds, in particular from regulation including increases in annual spectrum licence fees, mobile spend caps, international calls regulation and auto-compensation for fixed customers." Enterprise: "Revenue decline was mainly driven by the decline in the fixed voice market, where we are seeing a steeper than expected reduction in calls per fixed line, in part as usage moves to mobile and IP. We also saw continued declines in some of our other legacy products, for example private circuits, as well as lower equipment sales." Global Services: "Revenue decline was mainly driven by our strategic decision to reduce low margin business. While the impact of divestments did not have a significant impact in the quarter, it will have a greater impact going forwards." Openreach: "Revenue decline was driven by around £180m of regulated price reductions on our FTTC and Ethernet products, the impact of the Openreach volume discount offer, and a decline in our physical line base...EBITDA decline reflected lower revenue, higher costs from recruitment and training of engineers to support our Fibre First programme and to deliver improved customer service, pay inflation and increased business rates, partly offset by efficiency savings. " "So in summary, we continue to deliver consistently against our three strategic pillars. This has resulted in another quarter of sound operational and financial performance, although I should note we are also seeing increased market and regulatory challenges. There is no change to our overall outlook for this year, albeit we now see EBITDA coming in around the top of our guidance range. In terms of our medium-term outlook, we still expect regulation, market dynamics, cost inflation and some legacy product declines to offset trading and cost transformation benefits this year and next. But by 2021, we expect this to reverse. So there is no change to our overall medium-term outlook." Should business conditions remain challenging, not to mention the uncertainties caused by Brexit, BT's incentive to invest more aggressively into its business could eventually put its dividend on the chopping block once more. New CEO Philip Jansen will share more information about his plans for the company in May 2019. For now, BT appears to be a more speculative income play. Even if the company's dividend is maintained for years to come, we prefer to invest in high quality businesses that have multiple paths to long-term earnings and dividend growth. It's hard to gain that conviction with BT given the uncontrollable headwinds many parts of its business face. It's a tough life being a telecom company in the U.K.
Vodafone's U.K. General Counsel and External Affairs Director Helen Lamprell put it well when she said that "the U.K. remains a challenging environment [regulatory], one of the most challenging in the world." Overall, conservative investors are likely better off looking elsewhere for income, dividend growth, and more predictable returns.